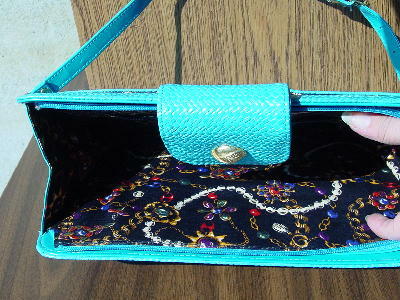 This turquoise purse has a black fabric lining with a necklace pattern in white, blue, purple, green, and orange. There is one exterior pocket and 3 center sections, one of which has a side to side top zipper and an interior zipper pocket. There is a center 3 1/2" wide flap closure with a gold-tone center adjustable ornament. 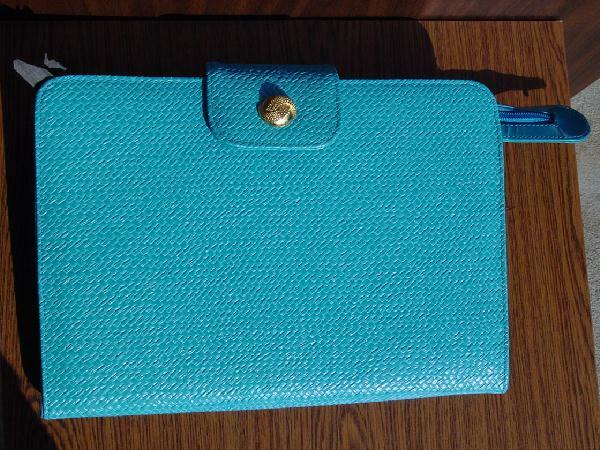 It has a detachable 48" long shoulder strap. The man-made material exterior has a faux basket weave pattern. It was used in a magazine photo shoot with a Hanae Mori white and rose blouse and a turquoise, white, and black silk crinkle skirt.